LET'S WALK TOGETHER TO END ALZHEIMER'S. 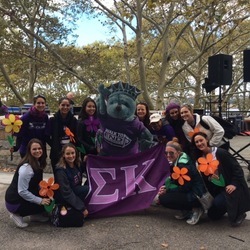 Every year, the NYC Sigma Kappa Alumnae Chapter participates in the Walk to End Alzheimer's. We encourage you to join our team to help spread Alzheimer's awareness! This year, we will be walking in Manhattan on October 26th with the Alzheimer's Association, NYC chapter. The 2018 Walk to End Alzheimer's will take place at the South Street Seaport at South Street & Fulton Street. Registration starts at 8:00a; the ceremony starts at 9:00a, and the Walk starts at 10:00a. Join our 2019 walk team HERE and help raise awareness for Alzheimer's disease and research.